Is there a link to the residential proposal? I'd be interested to see that. There have been a lot of comments along the line of this being far from ideal, but still good that some development is happening here. Again, I'm not very familiar with that area of Portland (aside from getting gas nearby and picking people up at the PTC when I worked on Sebago Lake during high school), but I wonder if this isn't one of those sites better left undeveloped. Sure, it's on the water, but without a high-rise, I can't see what views it has--the highway? the airport? the oil storage tanks? If there is a high-rise, I'd fear that it would end up being the rather unsuccessful tower-in-the-park type. It seems far too isolated to ever be a part of the downtown, and unless the PTC, parking lots and Fore River Parkway are developed, I think it will be difficult to get people to even walk there from Congress Street. I've already said that I think building a lot of office space, a convention center and an arena here would reduce the demand for those things elsewhere in more appropriate locations. I also think a major development here, which I believe would almost certainly be unsuccessful from an urbanist perspective, would use up a lot of energy better spent in Bayside, the Eastern Waterfront and elsewhere downtown, as well as getting a Downeaster stop somewhere in town. Mike, I agree with your assessment, totally. You are completely right. But, the tower I think would be good from a landmark perspective, not a streetview. Urban? No. Cool looking? Probably. If it is not going to be urban already, it might as well look better. I don't know why Bayside isn't pursued as a better option for an arena? Maybe because the surrounding area is NOT somewhere visitors want to see? All the blight on thompson's point is scheduled to be demolished, whereas in Bayside, it is under different ownership on each block. I don't know. Maybe the land is more expensive in Bayside? Also, the only parcel I can think of for sale right now that would fit an arena is eyed for a parking garage by the city (at some point, coupled with future development). Again, you raise all valid points, and I completely agree. And, for someone "not too familiar" with Portland, you fool me every time. If I didn't know better, I'd think you were a local. In my opinion, your knowledge of the City's layout is impressive. I like urbanism, big and small, near and far. I was just surprised to read an entire forum and agree with just about everything everybody says! Yes, I generally agree with the whole Richard Florida hypothesis that mega-projects never really revitalize anything. Especially mega-projects in outlying areas involving sports complexes and convention centers. But having known the developers involved in this project, I know that they have absolutely every intention to make this as transit-oriented, and connected to the urban fabric as possible. I completely agree with cneal that this may finally motivate the city to make better transit connections with downtown. Right now there is nothing, from an average riders perspective that can get you from the terminal to downtown. When you search on Google transit, it just tells you to take the #5 Metro to the Pulse center and then walk wherever you need to go. This is ridiculous! There should be direct service up and down Commercial St! Hell, technically the St. Lawrence and Atlantic Railroad still owns the ROW down the middle of Commercial anyway... They could decide to run BRT, Light Rail or Freight trains right down the middle if they wanted to! Of course they have no reason, but it would technically be possible. BTW has anybody ever pointed out that Lee Urban has the most job-appropriate name EVER?! For all I know I've been talking to him on this thread, but that would be like me having a name like "Andrew Freelance-Multimedia-Carfreetransitplanningadvocate"! To improve location on this project, maybe Jennings could team up with Foresly. If they combined their proposals, Portland would have a downtown convention center. Pipe dreams I know, but just a thought! UnionStation -- there have been arguments on this forum, but I agree they are usually pointless. It is hard to avoid, however, when it is something everyone spends so much time thinking about...the natural tendency is to assume because so much time is spent thinking about something, one must be right. I am aware of this, and of its inaccuracy, but I still succumb to an argument every now and then. As for Lee Urban, I don't think he is involved with the City anymore, but yes I have noticed his particularly well-suited name. Alan GREENspan is another. Then there are dentists named Dr. Toothaker. Funny. Urban was once quoted saying "nobody loves this city more than I do..." and I've always wondered if I might give him a run for his money. He is a lawyer, too. Oddly, I think he said he disliked big law, and wanted to be a small town country lawyer, ideally. As for Amtrak, I assume you are more knowledgeable than I am, but I thought the proposal was not to relocate the station, but rather to keep the current PTC site as the hub, and have merely a passenger landing closer to downtown for those who wished to get closer to the City. Is that not true? And you're right, the proposal for the new arena is very radiant city...if the middle were turned into a green, it would just become a radiant garden city. Richard Florida--I thought he was the whole creative class guy...right? I didn't know he weighed in on actual building proposals, too. Maybe I need to read more of his work. I think that folks are holding this to a bit of an unfair standard. We should keep in mind that developers have been spending billions of dollars on suburban office parks and freeway rest stop hotels for decades - look at the Maine Mall area, and the Route 1 strip in Scarborough. So yes, compared to the Old Port, this looks like a bit of a turd. And sure, it's going to be a pretty boring place. But compare this proposal to most anything that's been built in Scarborough in the past 30 years, and this looks pretty great. What I'm excited about is that this reflects increasing realization among developers that the suburbs may be cheap places to build, but they're not viable places to collect rent anymore. Tenants want office space where they have access to talented employees, and cheaper transportation options available that can reduce their employees' costs of living and commuting. The suburban office market has taken a bruising in the past 5 years, while Portland's office market is still seeing lots of investment (like the Cumberland Cold Storage renovation, which is a huge addition to downtown office inventory) in spite of the recession. I see a group of developers who could have easily built on the cow fields on Stroudwater Street in Westbrook or Haigis Parkway in Scarborough, and instead chose to propose a relatively dense development on an in-town location with close access to intercity transit links. And if you look at this, as I do, as the start of a trend - a trend of increasing investment in in-town Portland that could fill in the empty blocks of Libbytown and Bayside, and the empty or underutilized lands along Franklin Street and Interstate 295 - then you might find it kind of exciting. Though it's unlikely I'll ever go into any of these buildings once they get built, I can still appreciate the proposal for adding to the city's economic vitality, for providing more transit-accessible jobs, and for serving as a vote of confidence in urban redevelopment as a viable, profitable alternative to sprawl. City councilors also decide to fund transit projects with one-quarter of the tax money generated by the project over 30 years. PORTLAND – The City Council approved a $31 million, 30-year tax break for a new development on Thompson’s Point early today and decided to set aside 25 percent of the money the city will receive, to be used for transit projects. click image to enlargeBill Ryan Jr., left, and Jon Jennings, discuss plans to develop Thompson's Point into an arena/convention center complex they call "The Forefront at Thompson's Point" during a meeting in April. City councilors approved a tax break for the project Monday night. The council did not specify how it will use the transit money, although Councilor David Marshall pointed out it would be enough to pay for an express bus from the Portland International Jetport to the Portland Transportation Center – next to the proposed Thompon’s Point development – and then on to the Maine State Pier. 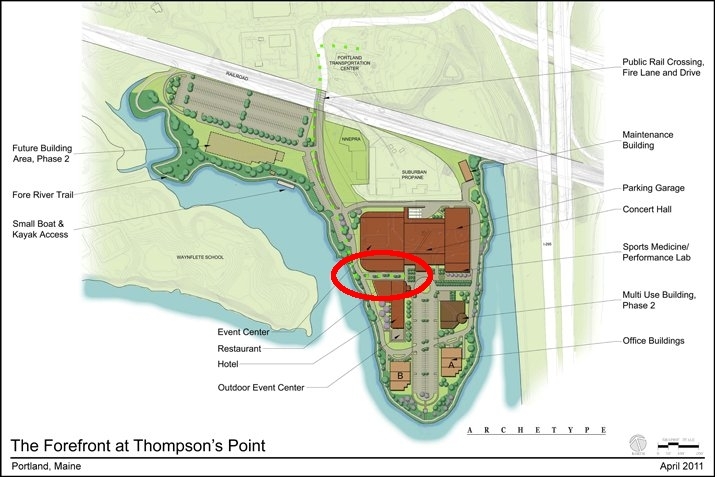 The tax break drew some opposition at the late-night public hearing, but a number of downtown development and transit officials praised the proposal, to be called The Forefront at Thompson’s Point, as a spur to economic development and a job creator. The $100 million project will include two office buildings, a hotel, an arena/convention center, a concert hall and a parking garage. The developers said they need the tax break to cover higher costs due to the marine clay on the site, as well as a costly rail crossing. Their timeline calls for getting city and state approvals by the end of the year, with construction getting under way early next year. The city will take in an estimated $26.4 million over 30 years, with 25 percent – or about $6.6 million in total – going toward transit. "Jennings is a former assistant coach for the Boston Celtics during the 'Byrd' era." - Do you think she means the Larry Bird era, or The Byrds era? That means they ought to be posting the meeting materials - including detailed site plans and architectural renderings - on the planning board website soon. I don't dislike this project because I am in favor of a growing city, but I certainly don't actively like it. For this much money, it could and should be so much more. What I don't like specifically is that in the renderings the parking garage is the tallest thing around. I don't dislike parking garages per se, but do they need to be the focal point? And what I am confused about is whether it is the TIF money being spent on the transit service or a portion of the otherwise due tax bill? A TIF can be used to capture the incremental tax value increase resulting from land improvements to pay for things like sidewalks and other capital improvements. Is that what is happening here only paying for transit? How will that help the developers pay for extra expense incurred from clay foundational work? If it is not the TIF itself, and in fact there is a TIF being allowed to finance the development itself, shouldn't the increased taxes be used to pay for general city wide transit first, instead of a loop that will directly benefit this project? Seems like a claim of special treatment could be made. On second thought, though, I don't think anyone will be flying or arriving by boat to a Red Claws game, and express buses don't stop at anywhere other than their destinations, so this may be an instance of just being located in the right place for an otherwise already planned transit loop. Either way, I don;t think the transit idea is bad, but maybe would be better spent elsewhere. Is there any chance that some of the design elements will change as things progress? This week's planning board workshop will be a good venue to advocate for urban design improvements. It's still early enough for the developers to make changes, especially if those changes might, in the long term, add value to their development. Under the current plan, the two buildings are attached. But imagine how that'll look to someone arriving by bus or train at the PTC: you cross the train tracks, and see the event building. But then you get annoyed: the main entrance is all the way on the other side! You end up walking roughly the length of a football field, dragging your luggage, to round the corner - at which point you then need to walk along the edge of a large parking lot before finally getting to your hotel lobby. I'll also ask that the hotel/restaurant should be brought right up to the sidewalk on the waterfront access street to improve urban design. That shouldn't be a hard push - hotel guests will obviously prefer a waterfront view of the Fore River than a view of suburban office park landscaping. A pedestrian street in between could also give the developers a neat little outdoor space to give their development some street life - potentially something like Yawkey Way or Portland Street (outside the TD Garden) in Boston. It would be a direct connection from the middle of the development to the quieter Fore River waterfront 50 yards away. I like the idea's too! Good suggestion, Cneal. Looking at these aerial site plans, it does appear that the project really turns its back on the PTC (as well as the rail yard and Suburban Propane property). Being so close to the PTC it makes sense to greet pedestrians from that direction as well as people entering from the parking lots. Also, I hadn't really noticed when looking at the plans initially, but I see a big parking lot next to the possible phase 2 section. This space is currently where Hood stores there tractor trailers (due to very limited space at their plant nearby on Park Ave/Congress). I wonder if they will be putting these trailers elsewhere? Oakhurst keeps there trailers in Bayside, and I imagine they will also be looking for somewhere new eventually. It will be odd to have all their trailers next to the whatever is built along Somerset Street. a. Shared infrastructure: Shared circulation, parking, and transportation infrastructure shall be provided to the extent practicable, with utilization of joint curb cuts, walkways, service alleys, bus pull-out areas, and related infrastructure shared with abutting lots and roadways. Easements for access for abutting properties and shared internal access points at property lines shall be provided where possible to facilitate present or future sharing of access and infrastructure. b. Buildings and uses shall be located close to the street where practicable. Corner lots shall fill into the corner and shall provide an architectural presence and focus to mark the corner. c. Buildings shall be oriented toward the street and shall include prominent facades with windows and entrances oriented toward the street. Uses that include public access to a building or commercial/office uses in mixed-use developments shall be oriented toward major streets whenever possible. with abutting properties are proposed or anticipated. If you plan to submit comments to the Planning Board before tomorrow's workshop, you can email them to Molly Casto: MPC@portlandmaine.gov. Reading the Munjoy hill news article I was surprised a hotel was already named. I was like what in the hell is Aloft hotels but after looking them up they're pretty sweet. Run by Starwood and an offshoot of the W hotels which are top notch. I stayed at the one in the theater district in Boston last year and would seriously have lived in the room we stayed in. I'm just glad to hear it's not another crap hotel with a dingy sign with three letters burnt out. Speaking of that, any news on what hotel the Eastland will become? That does seem like a nice chain, I hear good things about Starwood Hotels. I haven't heard any news about the Eastland since it was sold other than the issue concerning the removal of the apartments in the building and the waiver of not paying into the housing replacement fund which would have totaled over $2,500,000 [source]. The operator of the hotel, New Castle Hotels and Resorts, has the Eastland properly listed under independent properties. If they did partner with a brand, I imagine it would likely be one of the brands that they currently operate under: Marriott, Starwood, Hilton/Hampton Inn, & Intercontinental/Holiday Inn. Late this afternoon two principals of* The Forefront at Thompson’s Point met with members of the planning board to discuss their proposal for a mixed-use redevelopment on almost 30 acres of man-made land bordered by the Fore River and I-295, in Libbytown. Jon Jennings and Chris Thompson, redevelopers presented their Master Plan to discuss transportation and access-related matters of the proposal and to address any other broad issues before submitting their site plan for approval – at a later date this summer presumably. * The redevelopers expect to have all of their permitting completed by the end of this year. The two asked for feedback on the entire project since it is still in the conceptual stage. Thomas L. Gorrill, president of Gorrill-Palmer Consulting Engineers, Inc. said that work is beginning on a Traffic Management Plan which will be under the jurisdiction of the Maine DOT. * Traffic flow studies and other issues need to be addressed. * Gorrill said he hoped to have that study completed within three weeks or so. One board member, David Silk, suggested a site-walk at a later date. * Chair Jerry Lewis said that because of the size of the project,*a much wider distribution of meeting*notices should be made to the public. The date for the next planning board workshop*is yet to be determined. As I see it, this project is a cul de sac development with a center parking "green" -- how can they even refer to it as mixed use? The uses are all commercial, and the benefit of mixed use (all day activity) is therefore pretty much forfeited other than game nights.